Spusht: Favorite Appetizer in Indo-Chinese Cuisine? 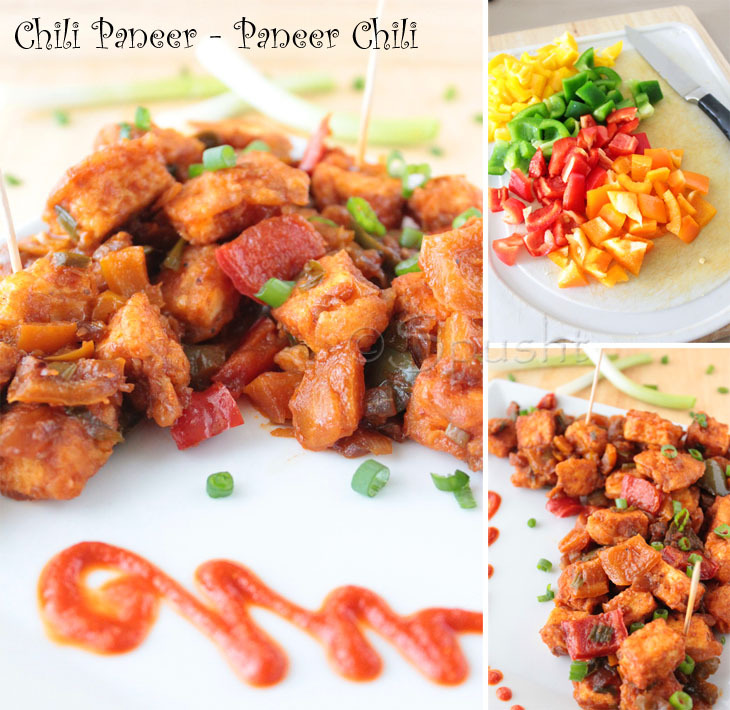 Chilli Paneer? Favorite Appetizer in Indo-Chinese Cuisine? 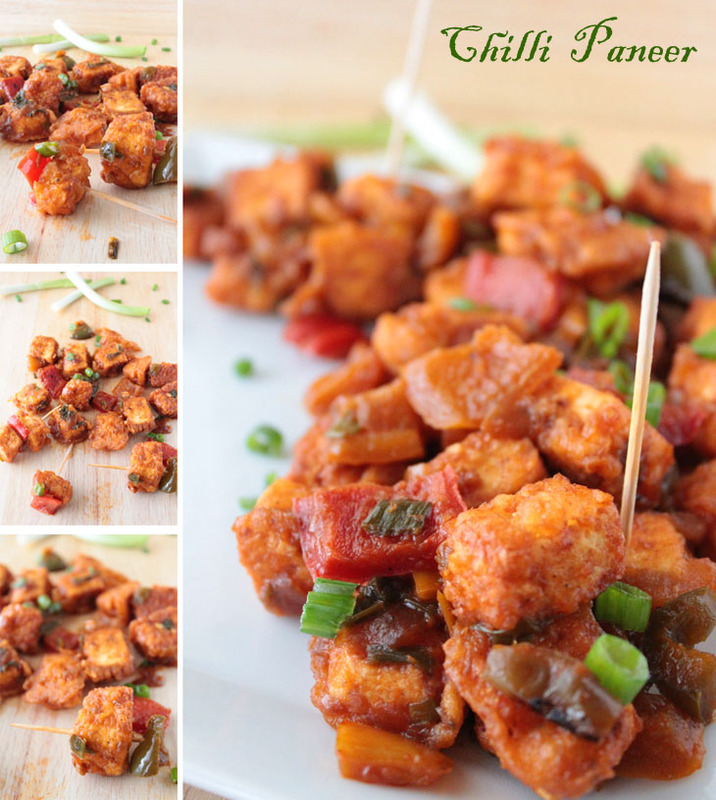 Chilli Paneer? Pick one. Quick. Real quick. Now tell me, what did you choose? Was it Gobi Manchurian, Vegetable Manchurian, or Chilli Paneer? Tell me it was Chilli Paneer. Because I’m about to show you how to make a good one! There are several non-vegetarian versions, Chilli _______ (fill in the blank with anything of your choice), but for vegetarians Chili Paneer takes the cake. 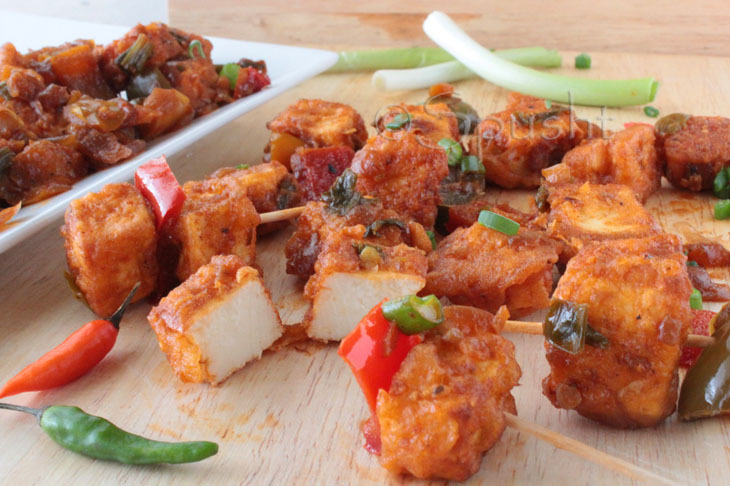 Written, spoken, and famous as Chilli Paneer / Paneer Chilli / Chili Paneer – the tongue twister can go on, but cut short: these fried paneer cubes coated in spicy-tangy gravy, with capsicums adding crunch and color, is just as mouth-watering as the other amazing dishes in the Indo-Chinese cuisine. 1. Combine all the ingredients (except oil); add little water gradually to make thick batter of dropping consistency. 2. Cut paneer into medium-sized cubes (or triangles! ); dip in batter & deep fry in hot oil till golden-brown. Drain & keep aside. 1. Heat oil in pan, add ginger + garlic + capsicum + scallion whites & stir-fry on high flame for half a minute. 2. Add fried paneer + soya sauce + tomato sauce + salt + sugar & mix gently for half a minute. 3. Finally add vinegar + cornstarch + water mixture + scallion greens & toss gently. Paneer Chili is ready, serve hot. 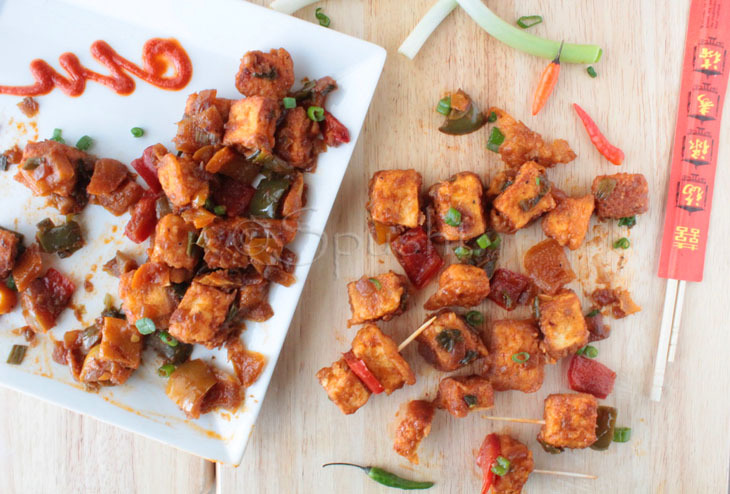 What to do with extra fried paneer cubes? And what to do with remaining Chili Paneer? Drooling here, such awesome and tempting clicks..
really yyummy n colorful ..
Feel free to drop your comments - opinion, ideas, correction, suggestion, related memories, discussions or questions - anything that makes me & this blog better or helps you & others is welcome! SPAM MESSAGES, ADVERTISEMENTS, AND COMMENTS WITH LINKS TO YOUR BLOG & EVENTS WILL BE DELETED. Creative Title Ideas from a Techie Hubby? Cooking Maggi Wrong Way Dangerous for Health? Koko – Kokonut Muffins - what? SPUSHT by Nisha is licensed under a Creative Commons Attribution-NonCommercial-NoDerivs 3.0 Unported License. Based on a work at http://spusht.blogspot.com. How to Cook Dal WITHOUT a Pressure Cooker? © 2011-2018 by Spusht, All Rights Reserved. ALL the information and photographs on this blog SPUSHT belong to the writer of this blog, unless specified otherwise. Credits given where deserved. NO MATERIAL WHATSOEVER from this blog may be copied, used, reprinted, or published without the writer's consent. Get permission first.